The history of quiltmaking in North Carolina spans four centuries and has been shaped by Tar Heels of nearly every ethnic group and social class. At its simplest, quilting involves stitching or tying a layer of batting between two pieces of fabric. But makers’ differing resources, styles, and intentions have resulted in a vast diversity of expressions over the course of North Carolina’s history. Upper-class European settlers initially brought quiltmaking to the American colonies in the seventeenth and eighteenth centuries. Imported fabric cost dearly, and only women of means could afford the large pieces of silk and chintz used to create popular styles. Rather, most families used blankets or coverlets for warmth. 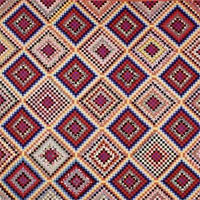 Relative to other colonies, North Carolina did not develop a particularly rich quilting tradition during this early period. The region’s challenging geography slowed in-migration and did little to foster the growth of a large moneyed class. 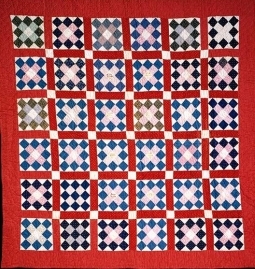 Even after statehood and through the antebellum period, the tenuous infrastructure, poor transportation, and overwhelming ruralness that contributed to North Carolina’s reputation as the “Rip Van Winkle State” also resulted in the creation of fewer quilts of exceptional artistry than in other parts of the young nation. Further, the South’s humid climate and abundant pests limited the survival rates of early textiles from that region, leaving scholars fewer examples to study and analyze. Abrahams, Ethel Ewert and Rachel K. Pannabecker. “‘Better Choose Me’: Addictions to Tobacco, Collecting, and Quilting, 1880–1920.” Uncoverings 21 (2000) : 79–105. Baumgarten, Linda and Kimberly Smith Ivey. 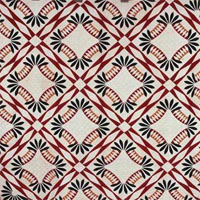 Four Centuries of Quilts: The Colonial Williamsburg Collection. New Haven: Yale University Press, 2014. Brackman, Barbara, comp. Encyclopedia of Pieced Quilt Patterns. Paducah, KY: American Quilter’s Society, 1993. Ducey, Carolyn. Chintz Appliqué: From Imitation to Icon. Lincoln, NE: International Quilt Study Center & Museum, 2008. Jones, Lu Ann. Mama Learned Us to Work. Chapel Hill: University of North Carolina Press, 2002. Kiracofe, Roderick. The American Quilt: A History of Cloth and Comfort 1750–1950. New York: Clarkson Potter, 1993. McDonald, Mary Anne. 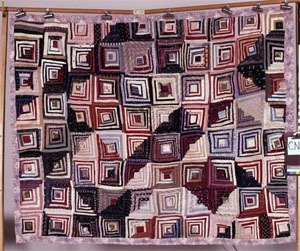 “Symbols from Ribbons: Afro-American Funeral-Ribbon Quilts in Chatham County, North Carolina.” In Arts in Earnest: North Carolina Folklife, edited by Daniel W. Patterson and Charles G. Zugg, 164–178. Durham: Duke University Press, 1990. Milspaw, Yvonne J. “Regional Style in Quilt Design.” The Journal of American Folklore 110, no. 438 (Autumn, 1997) : 363–390. Roberson, Ruth Haislip, ed. North Carolina Quilts. Chapel Hill: University of North Carolina Press, 1988. Roberts, Elise Schebler. The Quilt: A History and Celebration of an American Art Form. St. Paul: Voyageur Press, 2007. Shaw, Robert. American Quilts: The Democratic Art. Updated Edition. New York: Sterling, 2014. History of the North Carolina Quilt Project, the Quilt Index. http://www.quiltindex.org/contributor.php?kid=4B-BF-0 (accessed March 24, 2015). Lesson Plans, the Quilt Index. http://www.quiltindex.org/lessonplans.php (accessed March 24, 2015). 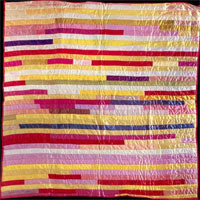 Quilts: the North Carolina Museum of History, used courtesy of the North Carolina Department of Cultural Resources. Love to Sew Studio. "Extra wide double fold bias tape being sewn as a binding for a decorative quilt." Photograph. Wikimedia Commons. Used under Creative Commons License CC BY-SA 3.0. http://en.wikipedia.org/wiki/Quilting#/media/File:Extra_Wide_Double_Fold_Bias_Tape.jpg (accessed March 24, 2014). A friend mentioned that she had seen a quilt exhibition at the NC History Museum several years ago that included "freedom quits," used as signs as part of the Underground Railroad. 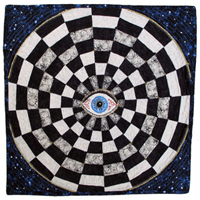 However, I have recently read that the idea of freedom quilts is a recent, 20th century literary invention. Can you clarify, please? Is there any evidence that quilts were used as signs for the Underground Railroad? I have a quilt from eastern north carolina- pitt or lenoir county dating probably from the 1830's but not sure. It was made either by my great grandmother or possibly her mother. I would like to donate it if possible. it is very fragile and was folded in the bottom of a trunk. I have taken it out but did not unfold completely as I was afraid of doing damage. I have it rolled in a white cotton sheet.